Find tickets for Stars of Orange Movie Fundraiser - Aladdin Premiere in Canberra! Stars of Orange Movie Fundraiser - Aladdin Premiere in Canberra! 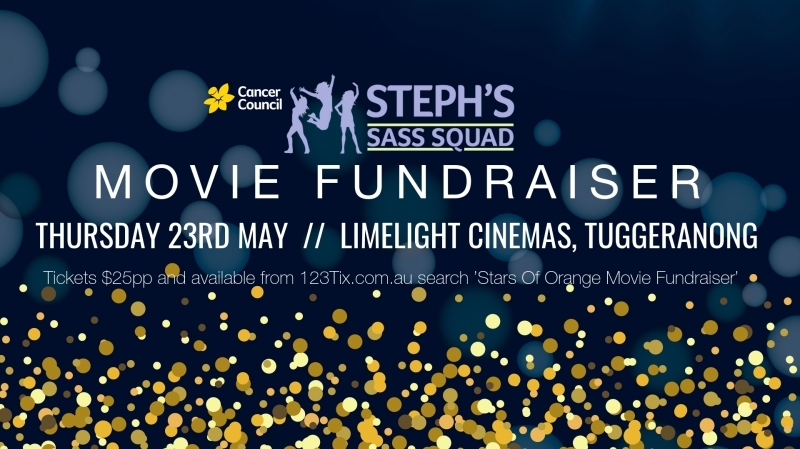 Join me raising vital funds for Cancer Council NSW and our Stars Of Orange Dance For Cancer efforts at a premiere screening of Aladdin at Limelight Cinemas in Tuggeranong, Canberra! This year I’ll be celebrating my birthday dancing with Steph's Sass Squad in loving memory of all those we have lost and all those facing their own cancer journey including my beautiful friend Steph so that we can be a part of creating a better future, together. Every single one of us have had a relative or friend go through cancer. We want to raise awareness and as much money as we can for brain cancer research through Cancer Council NSW. Helping fundraise for research will give us comfort in knowing money is going into helping Cancer Council do as much as they can to find a cure, prevent and support those affected. Book your movie tickets now for an evening of family fun seeing the premiere of Aladdin while also supporting the fundraising cause in working towards a cancer free future. Tickets are $25 per person and this includes the cost of a movie ticket and 2 x candy bar items (choice of mini popcorn, small drink and choc-top). Doors open at 6pm, movie commences at 6:30pm.